OXFORD, Miss. — It is a busy time in the Ole Miss athletic department. The men’s basketball team earned an NCAA Tournament bid, the baseball team is nationally-ranked and the Grove Bowl is rapidly approaching. But don’t forget, Rebel fans, your softball team is pretty good as well! 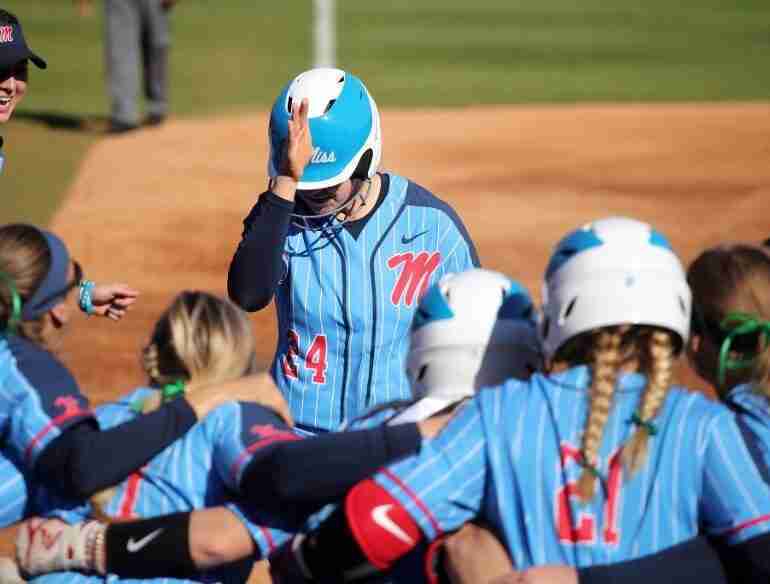 Ole Miss, ranked 15th in the current Softball America poll, heads to Columbia to take on 19th-ranked South Carolina in an early, yet pivotal, Southeastern Conference series beginning Saturday afternoon. The Rebels (21-7, 2-1 SEC) are up ten spots in the poll while Carolina (22-7, 1-5) fell three spots. But this is a conference series and that is quite different from mid-week games. Freshman Karly Heath leads the Gamecocks’ pitching staff with a 6-0 record and a 1.67 earned run average. Dixie Raley, who stands 6-foot-2, has also been impressive while posting a 7-1 mark with ten of her appearances coming in relief. The duo has combined for 87 strikeouts. Junior Cayla Drotar rounds out the staff with a 6-4 record. At the plate, South Carolina is hitting .322 with an SEC-best 55 doubles. The Gamecocks have also blasted 40 home runs. Sophomore infielder Jana Johns leads the way for Carolina batting .427 with six homers and has driven in a team-high 25 runs. Kennedy Clark (.395) leads the team with 11 doubles and Mackenzie Boesel (.382) is right behind her with ten doubles and 24 runs batted in. 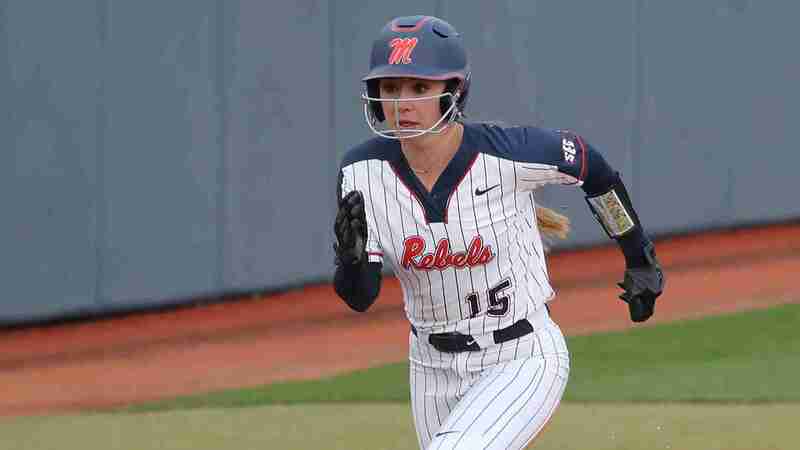 Ole Miss is paced by the reigning SEC player-of-the-week, Autumn Gillespie, who had a pair of homers and double to lead the Rebels to a 5-0 record during that stint. Gillespie is hitting those pitches. Her average sits at .313. Senior Kylan Becker leads the squad with a .460 average and a team-high six triples. She also leads the Rebels with 16 stolen bases. Abbey Latham, who leads the team with 26 runs batted in, is hitting at a .390 clip, while freshman Tate Whitley is batting .375. Puk shares the team lead with pitcher Brittany Finney with six home runs. In the circle, junior Molly Jacobsen is sporting a 9-1 record with a miniscule 1.17 earned run average over 66 innings pitched. She has also recorded 66 strikeouts. Finney has 55 strikeouts in 60 innings pitched, and sophomore Ava Tillmann rounds out the staff with a 5-2 record. Saturday’s first pitch is set for 1 p.m. (CT) with Sunday’s game starting at 5 p.m., and Monday’s start time at 7 p.m.
BACK HOME AGAIN: The series may not be in Oxford, but it is a homecoming. 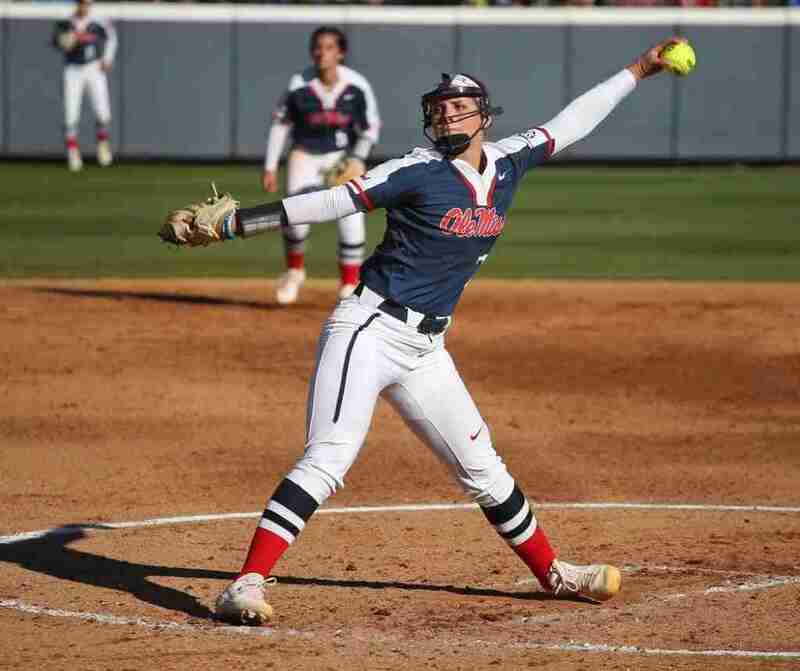 Ole Miss pitching coach Ashley Chastain played at South Carolina. While in Columbia, she earned both her bachelor’s and master’s degree. Although she played for the Gamecocks, she knows where her loyalty is now, yet the memories are still fresh. TWO OLE MISS TEAMS, ONE CITY: The softball team was not the only Ole Miss team in Columbia when the team arrived Friday. The Rebels’ men’s basketball team was in town for its first-round game in the NCAA Tournament. Unfortunately, the eighth-seeded Rebs fell to No. 9 Oklahoma 95-72. THE ALL-TIME SERIES: South Carolina leads the all-time series with Ole Miss, 32-25. The Gamecocks took 2-of-3 games in Oxford last season. Ole Miss returns home to host Florida next weekend. Previous article Rebel Walk Roundtable: Let the Madness begin!